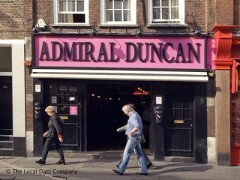 About: Admiral Duncan is a gay pub situated in the heart of Soho. They have a juke box that plays 80's and 90's music and gets very busy on a Saturday night. There is no seating so it's very friendly and a great meeting place. A cashback facility is available. The Admiral Duncan is a welcoming pub with great staff! Drinks aren't overpriced, though the pub is located in the heart of Soho. On a Sunday the entertainment is fantastic and the place is full!